Northumberland: Adderstone, Bamburgh, Bamburgh Castle, Beadnell, Belford (2), Bradford, Budle, Burton, Chathill, Detchant, Easington, Easington Grange, Elford, Ellingham, Elwick, Fleetham, Glororum, Hoppen, Lucker, Middleton, Mouson, Newham, Newstead, Outchester, Preston, Ratchwood, Shaston, Spindleton, Sunderland, Swinhoe, Tughall, Warrenford, Warrenton. The population falling within the union at the 1831 census had been 6,422 with parishes and townships ranging in size from Chathill (population 30) to Belford itself (402). The average annual poor-rate expenditure for the period 1834-36 had been £2,326 or 7s.3d per head of the population. The main building was a modest single-storey T-shaped structure accommodating up to thirty inmates. Belford main building from the west, 2001. A separate infirmary block was erected to the east of the main building. 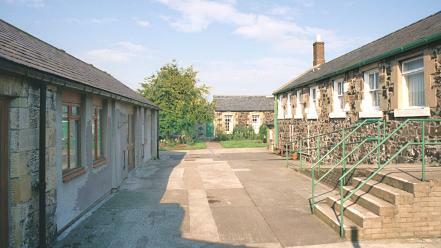 Belford infirmary block from the north-west, 2001. Belford from the from the north-west, 2001. In 2001, the premises were being used as a social services day centre. However, the buildings have now all been demolished.